Yep, there’s a new version of QueryPic. My enthusiasm for making tools is punctuated by regular bouts of doubt and disillusionment. With millions of dollars being spent on industrial-strength digital research infrastructure why should I devote my evenings to hand-crafting pretty little widgets like QueryPic? 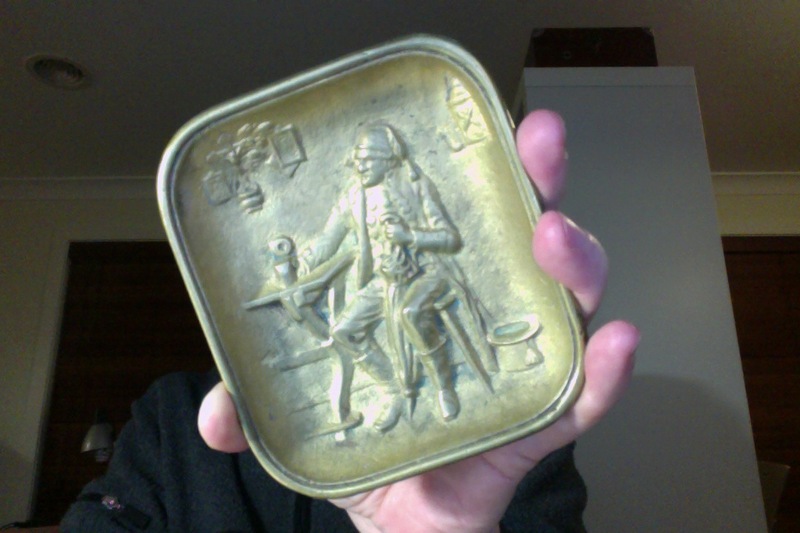 My grandfather made this brass dish. He owned an engineering workshop and forge. My dad was a draftsman, engineer and builder. My mum made fine dresses in the fashion houses of Melbourne. I make things too. It’s what I do. It took me quite a few years to work this out. Years spent wondering why I felt out of place in academia. I’m also a historian, so I research and I write, but without some time to tinker, well… I’m just not happy. Making things is not separate — for me it’s all part of being a historian. I make things that let people connect to the past in different ways. And along the way I learn. And by people I mean people. Just last week I took part in an online question and answer session organised by Inside History Magazine. It was a lot of fun. Amidst the questioning I unveiled the latest version of QueryPic. Considerable excitement ensued. QueryPic graphs are starting to be included in research publications, but anyone can make and understand them. Local and family historians are enthusiastic users of digital technologies and I’m excited to see them playing around with tools that I’ve made. I want to create things that other people use. Things that help them, and sometimes surprise them. QueryPic has graduated from WraggeLabs to dhistory — my platform for digital history research. There it joins The Front Page and Archives Viewer. As usual, I have big plans. Are they practical? Probably not. Are they sustainable? I doubt it. Will I keeping making things anyway? Of course. So please accept this gift. I made it for you. I hope you find it useful. 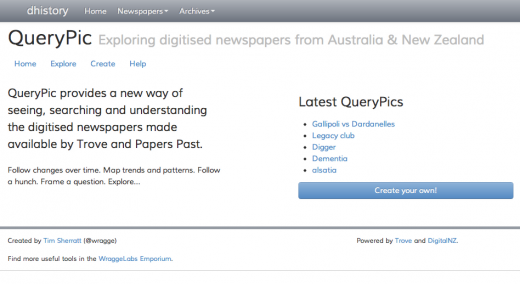 QueryPic — explore digitised newspapers from Australia & New Zealand. All this and more documented on QueryPic’s extensive help page. Code on Github. Don’t despair Tim – the things you make are beautiful and it is very clear to me and everyone else who it is that is making a positive contribution. If it helps I’ve buried my frustration into making a couple of these over the past four years. Very satisfying.